I live in London, work with numbers and spend most of my time studying Natural Sciences (Biology) with a focus on amphibians and reptiles. I have always been fascinated by the natural world. To be honest, I very often find animals much easier to understand than some humans. As a child, I used to spend my summer holidays helping out at my uncle's vet clinic - and the rest of the year nagging my parents for an 'unusual' pet. 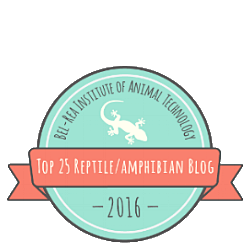 This website (formerly 'Dooferette Herpetology') started off as a way to share my thoughts on different animal and human matters. Today, it is much more than that. It gives me the opportunity to exchange knowledge, ideas and recommendations with people from all over the world. If you'd like to see my little ones, follow me on Instagram - I certainly share more photos of them than I should! I hope you find this website useful or, at the very least, mildly entertaining. Do get in touch if you have any questions or feedback. Please note that unless indicated otherwise, all photographs on this website are copyright protected and may not be copied or reproduced without permission. — Dr Nick Lane, 'Life Ascending: The Ten Great Inventions of Evolution'.